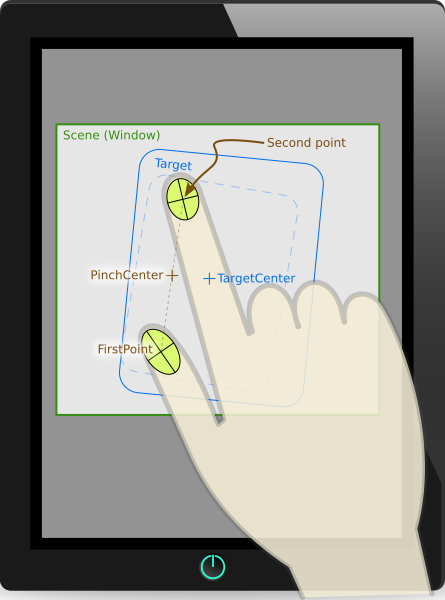 PinchHandler is a handler that interprets a multi-finger gesture to interactively rotate, zoom, and drag an Item. Like other Pointer Handlers, by default it is fully functional, and manipulates its target, which is the Item within which it is declared. It has properties to restrict the range of dragging, rotation, and zoom. color: handler.active ? "darkgreen" : "black"
(handler.scale * 100).toFixed(1) + "%"
This property is true when all the constraints (epecially minimumTouchPoints) are satisfied and the target, if any, is being manipulated. A point exactly in the middle of the currently-pressed touch points. If pinchOrigin is set to PinchCenter, the target will be rotated around this point. The average velocity of the centroid: a vector representing the speed and direction of movement of the whole group of touchpoints, in logical pixels per second. The maximum acceptable rotation to be applied to the target. The maximum acceptable scale to be applied to the target. The minimum acceptable rotation to be applied to the target. The minimum acceptable scale to be applied to the target. The pinch begins when this number of fingers are pressed. Until then, PinchHandler tracks the positions of any pressed fingers, but if it's an insufficient number, it does not scale or rotate its target, and the active property will remain false. The point to be held in place, around which the target is scaled and rotated. The rotation of the pinch gesture in degrees, with positive values clockwise. It is 0 when the gesture begins. If target is not null, this will be automatically applied to its rotation. Otherwise, bindings can be used to do arbitrary things with this value. The scale factor. It is 1.0 when the gesture begins, increases as the touchpoints are spread apart, and decreases as the touchpoints are brought together. If target is not null, this will be automatically applied to its scale. Otherwise, bindings can be used to do arbitrary things with this value. The translation of the gesture centroid. It is (0, 0) when the gesture begins.